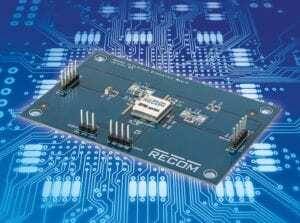 For its recently released RPM and RBB10 series, RECOM introduces corresponding evaluation boards which offer a shortcut to the otherwise long-winded testing, as these boards provide customers with an effortless way to evaluate these DOSA modules. The evaluation boards for the RPM‐1.0, RPM‐2.0, RPM‐3.0, and RPM‐6.0 buck regulator series generate a constant output voltage with an output current up to 6A from an external DC source. Hereby the multitude of functions offered by the RPM power modules such as trimming, sequencing, soft‐start, enable, and sensing can be evaluated. More importantly, the behavior in overload or over temperature can be easily assessed early in the design phase. RECOM also released an evaluation board for the RBB10 buck/boost converter, which generates a regulated output voltage with a current up to 4A from an external DC supply which can be higher, lower or the same as the set output voltage. The output voltage is preset to 3.3V or 5V but can be adjusted between 1.0V and 5.5V using on‐board resistors. All of the functions of the RBB10‐2.0 regulator such as the different operating modes, output trim, enable, and the sense input can be easily evaluated using the break out connectors. Converter samples and the evaluation boards are available from stock.